Discover the stunning coastlines and limestone karst scenery of the Andaman Sea. Don't worry about having to get too physical, while there will be plenty of activities to keep all your family happy, all of our holidays are very much soft adventures. Best of all, in between your activities on and around the Andaman Sea, your family will discover the real Thailand that only a few people are lucky enough to experience. We and our own staff in Thailand, along with our unique network of local people will ensure you have unparalleled experiences which will truly broaden your family's horizons, giving you memories to cherish forever. This two-week Tell Tale trip starts with a few days in bustling Bangkok where you have an opportunity to tick off the main sights with our expert guides, in between activities like cycling through lush green countryside and a private boat trip discovering life along the canals. Then it's time for your family to head south to Krabi on the Andaman sea! You'll snorkel in coral reefs teeming with tropical fish and learn to kayak in the mangroves, with the sound of monkeys chattering in the air. Explore the lagoons and magical caves of the uninhabited Hong islands, some of the most beautiful in Thailand and sunbathe on their beaches with only the giant monitor lizards that lazily bask for company. Other highlights of this family activity holiday include whitewater rafting, exploring a tropical rainforest and zip lining. In between your Andaman activities, you will discover the real southern Thailand, meeting many local people, including our friends, Pah who will show you the secrets of making the best desserts in Thailand and 'Eh' who will show you how he farms rubber - a great way for your children to find out where their trainers come from! "It was an amazing holiday which we will all remember for the rest of our lives"
Fly from London Heathrow on a direct flight to Bangkok with Thai Airways or Eva Air. We're also able to arrange flights from other airports including Manchester, Newcastle, Edinburgh and Humberside. If you don't live in the UK, ask us if we can arrange flights for you or you can book excluding tours, starting the trip with a pick up at Bangkok airport on 'Day 2'. You'll be met at Bangkok airport by one of our drivers and driven away from the hustle and bustle to a residential area just north of the centre. Here you'll arrive at a charming and comfortable homestay (you will have a private annexe or chalet/s with private bathroom in the garden of the family's main home). Settle in and relax in the ambience of a real Thai neighbourhood before a delicious home-cooked dinner with your hosts. You'll be taken to a local temple in the neighbourhood, you can even feed the fish to 'earn merit'. Then you'll head into the city and one of our guides will take you for a private boat trip along the river and canals. This is a great way to see Bangkok, and you can stop at points of interest such as the porcelain-covered Wat Arun, an artists house with puppets and the glittering golden barges belonging to Thailand's royal family. Then you'll have time to explore the city, visit a night market by the river or have dinner in one of our recommended restaurants (plenty of Tell Tale tips and a map in the pack you'll receive before your trip), before you're taken 'home'. "Far beyond expectations. A magical experience. Everything fell in place perfectly, like a jigsaw puzzle. " Local flavour galore. You'll go cycling just outside Bangkok, with a guide, through green countryside and along canals. We've designed this day to be suitable for children and the day will be paced to your family. You'll meet people living in traditional canal-side community, quite a contrast from modern Bangkok! You'll see genuine local markets and even learn about rice and agriculture and organic farming. This evening you'll have an informal authentic Thai cooking lesson, before you feast on your efforts. Tick off the tourist sites. One of our expert guides will take you around the main sights in Bangkok, the Grand Palace and the Temple of the Emerald Buddha and Wat Pho, famous for its golden reclining Buddha. Head back for dinner or you can explore Bangkok by night, it's up to you. This Tell Tale trip has been designed in a way to be well paced and without too much travelling. If you'd like to spend a day with elephants, we can replace today with a day trip to Elephant's World in Kanchanaburi, however, it's a 3-hour drive. We would recommend adding 1-2 days to the itinerary and staying in Kanchanaburi, or talk to us for other options. Our driver will take you to the airport and you'll take a short direct flight to Krabi. Here you'll be picked up and driven to your comfortable chalet/s (2 chalets for a family of 4 or 5) which are away from the touristy area but close enough for you to get to. Spend the afternoon settling in and having a dip in the pool. This evening, you'll be driven to Krabi town to a night market to graze from stalls selling a variety of local food. From spicy southern chicken to roti made as you watch, there's something here to tempt every member of the family. Kayak through the mangroves that protect the shoreline after (with specialist guides). This activity is on a 'join-in' basis. Evening visit to a local village for a walk with one of our friends, Eh, and dinner with his family. His sister Pah's Massaman curry (a southern Thai dish) is legendary. You'll also learn how to make Thai desserts. Private boat trip on the Andaman sea amidst the spectacular Hong islands with their tall limestone karsts, sheltered lagoons and pristine white-sand beaches. You'll have a delicious picnic lunch. You can also explore the caves with your new-found kayaking skills. This evening is your first free evening, you can take a tuk tuk to the nearby beachfront where there a variety of restaurants to choose from, just check the tips in your Tell Tale pack. 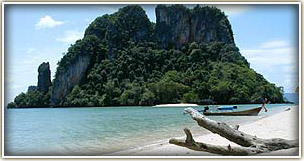 "Beach and snorkel hopped around Krabi's archipelago. Swimming with fish was unforgettable. We were always first or second to beaches sometimes we were taken to spots that stayed quiet and had lunch under a tree." White water rafting on a river (with specialist guides) who will show you how not to fall off! This activity is on a 'join-in' basis. Try your hand at rubber farming, then enjoy lovely hot springs, explore the last rainforest in the Krabi area, home to beautiful tropical birds and the giant 'Emerald Pool', whose colour can be a shade of blue or green depending on the temperature, though inviting to dive into at any time of the year. You're off on another private boat trip! Snorkel amongst tropical fish and let out your inner Swiss Family Robinson at farther-away Bamboo Island. You'll also visit Tap island, known its sand bar which can be walked along at low tide and 'Chicken Island' a lovely spot to snorkel. You'll have a picnic lunch today. Keep your eyes peeled when you are journeying on the boat, you may be lucky enough to see dolphins. Exploring the Krabi mainland with our driver, you can set your own pace - we recommend stopping at a local handicraft village, visiting waterfalls and then making a detour to one the best beaches, but it's up to you! You'll stop to see coconuts being harvested by monkeys. Day at leisure, relax by the pool, take a tuk tuk to the beach or to the fish farm where you can fatten up the gigantic catfish even more. Fly back to the UK (via a short connecting flight from Krabi to Bangkok), arriving at London Heathrow at approximately 7pm UK time (same day). This 15 day private family adventure holiday costs from £1,840 per person, discounted to £1,762 for 12-15 year olds and £1,380 per child under 12. This includes scheduled flights from the UK, accommodation, activities/excursions, transport and most meals. The price excluding flights is £1,240 per person and £930 per child under 12. Please allow approximately £50 per person for entrance fees payable on the ground. Prices apply most of the year including Easter and half terms, subject to flight seat availability, early booking is advised. Peak summer and Christmas travel will be subject to extra costs, please contact us for a quote and note early booking is advised (for the best prices, 11 months or more beforehand if booking including flights). Telephone us for a chat on 0207 060 4571. All photos on this page below the Buddhas (staff photo) are with thanks to the Hughes family for sharing their photos! They took 'Action on Shore' in 2016.